In March 2015, the Savannah College of Art and Design was one of the first colleges to roll out a virtual reality experience with its acceptance packages. The admissions and recruiting strategy has since been reproduced by other colleges as a way to engage potential students. Following that project, SCAD has been introducing immersive experiences like virtual and augmented reality into other admissions areas and signature events — from pockets of its television festival to posters that go into teacher’s classrooms and guidance counselors’ offices. This past August, SCAD released an augmented reality catalog detailing degrees, majors and other opportunities for students interested in a tech-infused arts education program. Students who received the 384-page 2016-17 catalog could use the SCAD mobile app to see more than 85 trackable pages, 150 digital assets and 200 micro-interactions in AR, which included tours of residence halls and chats with admissions staff members. To date, the college has reported seeing more than 18,000 uses of the AR functionality on its app, and 200 gigs of data have been consumed thus far. Officials hope that introducing an AR experience into the admissions process will give prospective students a glimpse into the cutting-edge arts experience that awaits them at the college. “We teach a lot of these immersive technologies, so if we’re showing it through the admission process, it really shows the tone of what’s being done in the classroom,” said Dave Hanak, SCAD’s executive director of interactive services. Campus Technology recently interviewed Hanak, who manages all of the design, development and content for all of the school’s interactive experiences (from web to mobile apps to VR/AR). Working on the administrative side, he has seen SCAD’s 40-plus programs spanning visual arts, fashion, filmmaking, animation, architecture and more all leveraging and designing curriculum surrounding these immersive technologies. Here, he offers some tips for creating an AR catalog. Using a smartphone and SCAD's mobile app, prospective students can use the AR functionality to virtually tour residence halls, talk with admissions staff members and more. Image Credit: SCAD. Hanak’s team recognized that the 2016-17 AR catalog pulled together resources that could be used as a marketing tool for the institution. “It’s great for someone who gets in as a student, but then it’s also great for our team to have almost this product book that encompasses all of the visual media assets that we want [marketing teams] to have,” Hanak said. Hanak and his team approached SCAD’s admissions officials and pitched the idea of creating additional resources that would take advantage of the AR functionality on the app. For example, they created a 10-page “teaser” book for marketing teams that offered an overview of SCAD’s programs with links to additional information. To showcase student work from a particular area like Industrial Design, for example, they can tap on that to display a design reel. There’s a lot that happens in between the time students are accepted into SCAD and when they enroll in classes. Hanak and his team have incorporated AR into multiple stages of the process. For example, students can choose to receive an AR catalog when they’re first learning about SCAD. If they apply or attend an admissions event, they will also receive the SCAD-branded set of VR cardboard goggles that went out with acceptance packages in 2015, enabling them to take a virtual tour of SCAD’s four locations around the world. Once they are accepted, they receive a custom acceptance video that is tailored to them — giving callouts to the program they’re interested in, the location they're going to and even identifying the student by name. He said it was a bit of challenge incorporating AR into the production process since it was already a demanding timeline just in print. But the collaboration was necessary to meet the overall vision. Students were also involved in developing the catalog, working with academic leadership to identify which pieces of student work they wanted to really focus on. One challenge that the interactive services team ran into off the bat was the limited space within the printed catalog. The program sections, for example, have only three to four pages to tell the entire story of one program. Content for these pages goes through a very rigorous vetting process in which department heads and others decide the specifics. In working with academic leadership, Hanak’s team offered to include digital components that would help augment the information that’s in the catalog — without taking up extra space. “We realized that we had a lot of these assets at our fingertips: We have our own in-house visual media teams, our own photography team, and a lot of these assets were already out there that we knew we could leverage,” he said. 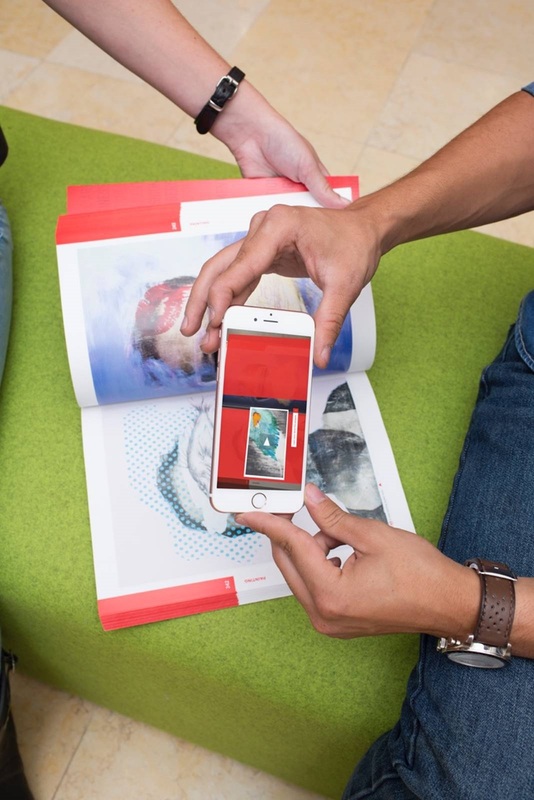 To experience the AR-trackable catalog, download SCAD’s mobile app via the Apple App Store or Google Play Store and simply hover a smartphone or tablet over its pages. For example, to showcase a ring designed in SCAD’s jewelry program, interactive services obtained a digital rendering to include a 360-view in the catalog. Hanak said that the AR catalog was “us dipping a toe into this kind of arena,” and SCAD has plans to continue exploring the use of immersive technologies across campus operations.